Going to a Master Gardener Plant Sale is an annual field trip for any soul that appreciates growing plants, buying plants, listening to plentiful and solid advice, and watching newer growers relish in what’s to come. Usually held in May, the local county Master Gardener groups schedule their annual sales; their largest fundraisers to support the organization and what it does in the county. Following are the sales this month, as well as other notable groups in the area. Find out where to go, and what you’ll find when you get there! Snohomish County Master Gardener Foundation Plant Sale: Saturday, May 6. More than 8,000 tomato, herb and vegetable starts will be up for sale, as well as perennials, native plants, trees, shrubs, ground covers, and living garden art. Master gardeners will be available to answer questions, and vendors will be offering specialty nursery items, gifts, and garden art. The sale runs 9 a.m. to 2 p.m. at the WSU Snohomish County Extension, McCollum Park, 600 128th St. SE, Everett. For details, call (425) 357-6010 or see www.snomgf.org. Growing Veterans 2nd annual Spring Plant Sale: Saturday, May 6. 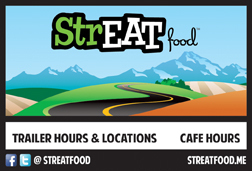 A variety of vegetable starts will be available, with all proceeds supporting this non-profit organization. Visitors can also view demonstrations and learn about transplanting starts, irrigation techniques, fertilization, and planting for pollinators. The sale runs 10 a.m. to 2 p.m. at 21025 Starbird Road, Mount Vernon. See www.growingveterans.org. 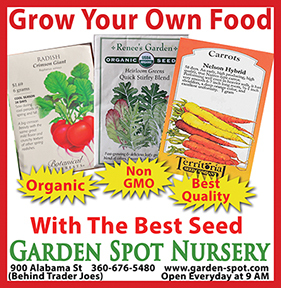 26th Annual Whatcom County Master Gardener Plant Sale: Saturday May 13. 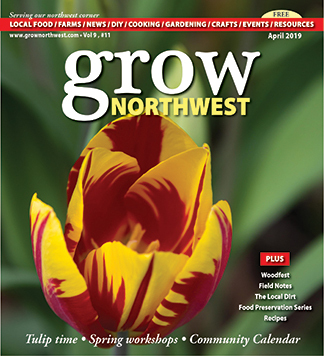 Each year the Whatcom County Master gardeners grow, divide and propagate hundreds of plants. Visitors can select from 20 varieties of tomatoes, specialty perennials, herbs, shade plants, natives, dahlias and more. In addition, local plant and food vendors will be on site, the Plant Clinic and Information Booth will be open to take questions from visitors, and more. The sale runs 9 a.m. to 2 p.m. at Hovander Homestead Park in Ferndale. Funds support the educational demonstration gardens, community projects, free workshops and our free plant clinic. In 2016, Master Gardeners provided 7,000 hours of volunteer service to the community with education, stewardship, leadership and sharing skills with youth and adults. For more details, visit http://whatcom.wsu.edu/ch/mg.html. 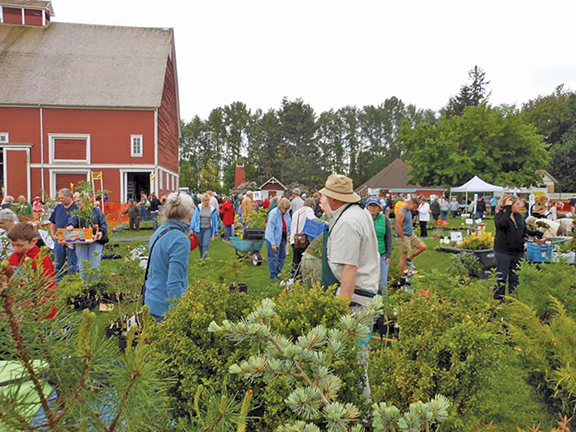 WSU Skagit County Master Gardener Plant Fair: Saturday, May 13. Join the Master Gardeners from 8 a.m. to 2 p.m. for a day of plant sales and lots of gardening related fun! This year’s special events include a display of antique tractors and gas engines, the small animals from Skagit County 4-H, PLUS many vendors and thousands of plants. Skagit County Fairgrounds (South Entrance), 479 W Taylor Street, Mount Vernon. 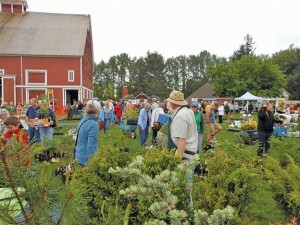 For further information visit: http://ext100.wsu.edu/skagit/mg/plant-fair/. Island County Master Gardener Foundation Plant Sale: Saturday, May 13. A number of perennials, native plants, shrubs, veggies, and more will be available. Visit with Master Gardeners at the plant clinic to have your questions answered. The sale runs 9 a.m. to 1 p.m. at Greenbank Farm, 765 Wonn Road, Greenbank. See http://ext100.wsu.edu/island/gardening/master-gardeners/. Everett Garden Club Sale: Saturday, May 13. Find an assortment of indoor and outdoor plants, garden art and plant related items. The sale runs 9 a.m. to 2 p.m. at the corner of 52nd and Evergreen Way (Party Display & Costume parking lot) in Everett. See everettgardenclub.weebly.com. Cascade Cuts Plant Sale: Saturday, May 20. This large wholesale nursery opens to the public one day a year for a Sustainable Connections Food & Farming Program fundraiser. Look through perennials, annuals, veggie starts, herbs, ornamentals, and more. Unique offerings include coffee trees, hops, compost tea machines, and unusual herbs. 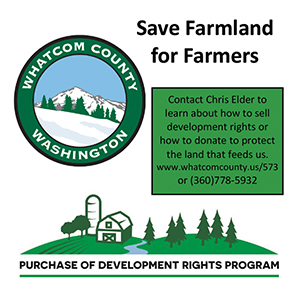 All sales go to the Sustainable Connections Food & Farming Program, including the new farmer training program Food to Bank On and Whatcom County Farm Tour. The sale is open from 9 a.m. to 4 p.m. at 632 Montgomery Road, Bellingham. 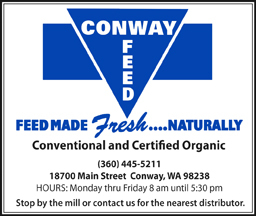 Call (360) 647-7093.